A knight in shining overalls. 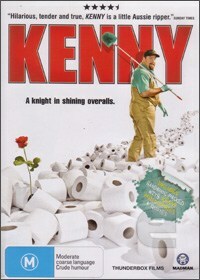 The Australian cinema "hit" has finally arrived on DVD that tells the tale of Kenny Smyth, an unsung hero who supplies the denizens of Victoria with porta-loos. This mock "documentary" follows Kenny as he explains the basics behind the world of porta-loos, travelling from one venue to the next, in order to ensure that the bodily functions of thousands are kept under control via his company "Splashdown". Although the story may seem like your traditional "poo" and "wee" jokes, the creators of Kenny (The Jacobson Family), ensure that our hero also has a human side as he fights with his ex-wife, tries to raise a son on weekends, attempts to live up to his father's expectations in Ocean Grove and falls in love in Nashville Tenessee at the International Pumper and Cleaner Expo. This movie, even though rated M15+ could almost be considered a family movie as the jokes are rather "clean" and there are enough laughs in the tale to have a good time, however, the story unfortunately begins to drag on near the end of the movie as if the director had lost his original vision. Worth seeing to see what all the hype was about. Bonus Scenes - 11 hilarious bonus scenes straight from the cutting room floor!